The Art Of Living is a small book (144 pages) with big messages. I consider this book a personal development classic because while it's a modern book (1994), it’s author Sharon Lebell's "interpretation" of the classic work by stoic philosopher Epictetus. Epictetus was born in A.D. 55 in the eastern outreaches of the Roman Empire. The book has been called the Western equivalent to the Dhamapada or the Tao Te Ching. It is a book of philosophical teachings in the stoic tradition. This interpretation is very easy to read because it has been written in modern language. You can read the original interpretations of Epictetus in his Enchiridion or Discourses, but those are not easy to read in comparison. This is also easy to read because it is broken in to 93 lessons or instructions (some are only a paragraph long, others a page to page and half at most), making this an easy book to pick up and read in parts during little moments of spare time. What I like most is that it's based on personal development of character, virtue and behavior. It instructs you on how to think clearly and how to work on yourself daily to become a better person. It's about action and application not just theorizing. The philosophy also recognizes that everyday life is fraught with difficulty, losses, disappointments and griefs and teaches you how to think right about these events and how to rise to meet challenges. I have this in my kindle, but I also picked up the original hard cover edition years ago and still have it. Even though I've read it numerous times, this one always stays on my shelf within arm's reach, to pull down and review, or where the mere sight of it will be a cue to remember the messages inside. For centuries people asked how can I live a happy, fulfilling life? How can I be a good person? The usual reply was often: Read Epictetus’s Manual. And the response to that was Epic who?! Yes, Epictetus, although a great philosopher, was not well known. He was born into slavery around two thousand years ago in the eastern part of the Roman Empire. At an early age he exhibited superior intelligence and was liberated and sent to Rome to study under Gaius Rufus, the stoic philosopher . He soon became a famous teacher with a large following whose teachings focused on dignity, integrity and tranquility. The biggest feather in his cap was his student Marcus Aurelius Antoninus, who later became the ruler of the great Roman Empire. 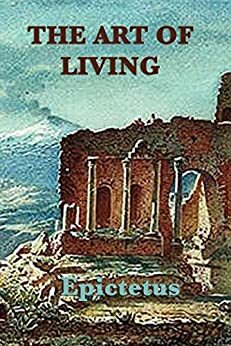 Born in AD 55 Epictetus died around AD 135 in Nicopolis, Greece, leaving behind a great philosophical legacy which endured for more than 2000 years. Sharon Lebell, the author of this book, entitled the Art of Living, was intrigued by the old philosopher and his age-old teachings . She researched and edited his old philosophical writings ( which were collected by one of his students and called the Manual) and presented it all in a modern readable form. Across centuries and cultures world leaders, generals and even ordinary people have relied on the Epictetus's Manual for guidance in their struggle for personal serenity and moral direction. It is impractical to list here all the Manual’s 93 directives, but few samples will give the reader an idea of the Manual’s style and content. - As you think, so you become. - Events in themselves do not hurt us but our attitudes and reactions give us trouble. - The trials we endure can and should introduce us to our strengths. - The surest sign of the higher life is serenity. - Refrain from trying to win other people’s approval and admiration. - Show kindness to people who are hurt or depressed but don’t allow them to pull you down. As we can see from the Manual, the emphasis used to be on personal and social behavior leading to tranquility and happiness. How have our lives changed in the past 2000 years, and can we say that we are a happier genre of people? The fact is it would be futile to try to make a comparison. We now live in a different world altogether - a world engulfed by technology and science and promoted and supported by materialism. Even our spiritual life has taken new trends and complex forms. We have long passed and left behind the social structure and mores of the Epictetus period. In fact we can safely claim that social serenity and tranquility are almost a thing of the past. 5.0 out of 5 starsPhilosophy for life!!! Get rid of academic and pop psychology books and buy this book! I applaud author for beautiful interpretation of Epictetus, less known, but perhaps most necessary of ancient thinkers. This book is perfect to read 5 pages per day, and within easy grab on nightstand (do not debase book by placing it to close to self help books, or modern political autobiographies). It is a book to savor and reread many times during your lifetime. Hard to beat the wisdom of Epictetus! His thoughts are just as relevant today as they were when he wrote them originally. Great guides to a happy life with a lot less stress.